My painting of “Margaret and her Nook” has been published in an online mag called “Art and Beyond”; here is the link to the magazine; you will need to click forward to find my page. My painting of “Fur” has found its forever home, after being on exhibit for only a few hours at the Bedford Library. My painting of “Willow Path in Winter” has been accepted in the annual JPOS (Jamaica Pond Open Studios) exhibit at the Arnold Arboretum in Boston. Reception Thursday Sept 18, 6-8. My application to apply to the Copley Society in Boston has been accepted–allowing me to apply for Professional Artist Membership, which requires a long checklist of images and written materials that I need to produce before a January deadline. Checklists? No problem for a former tax lawyer. Listing the good things maybe once a month will at least boost my spirits, even if it doesn’t have any noticeable effect on sales. Sales are the ultimate boost in spirits. Nothing says “I love your painting” quite like the handing over of real money in exchange for the painting. One of my teachers had a standard reply to anyone who said “I love your painting”: . . . “It’s for sale.” But we can’t all buy all the paintings we love. I know that all too well. So it’s OK to keep telling me when you love my painting even if you can’t buy it. So, down to the real business, that of creating beautiful paintings, maybe to sell. I spent two afternoons last week in a garden full of little nooks and pathways and whimsey. This garden is hidden behind an ordinary house in an ordinary neighborhood. It was created by colleagues of mine, a photographer/painter-husband/wife combo–although credit for the garden has to go principally to the husband. The wife, Dee Lessard, paints beautiful still lifes but has little experience with plein air painting (or gardening). Her husband, Guy Lessard, was pretty pleased to find Dee and me at our easels in his garden, immortalizing the beauty he had built. If you follow the path marked by the stepping stones, into the darkness beyond, you come upon a pool full of dappled sunlight and brilliant koi. I longed to see (and paint) a figure leaning into her reflection here. But saving that one for when I have a model, I chose this simple scene that melds so delightfully a half dozen different plant varieties. I completed this one in a two-hour afternoon, just before the skies opened up in buckets of water. A few days later, we went back out, Dee to continue working on the one she had started and me to find another magical place. No. 2 is to the right and down a slight slope from No. 1, looking back at another path to get to the koi pond. Guy rescued the little church birdhouse in an antique store with steeple intact. But adverse elements had obliterated the steeple over time, so I was painting what could have been a New England meeting house when Guy came over and requested that I add the steeple. I was only too happy to oblige. 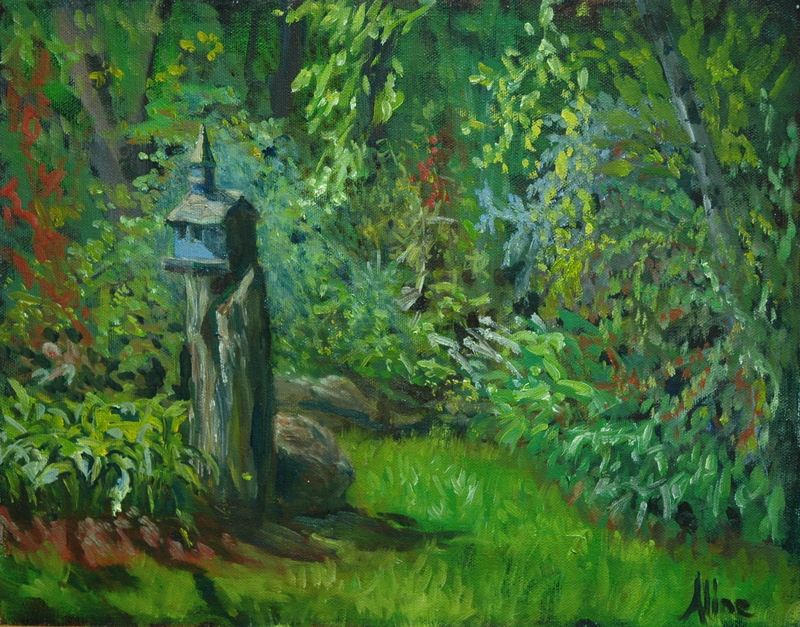 For both garden paintings, I had started with a surface toned dark, mostly with burnt umber. Very little of the toned surface still shows, but where it does, it enhances the contrast that makes a painting interesting. 6 inches by 6 inches has recently become a popular size for two-dimensional art pieces because they are affordable and are highly collectible. But for the past ten years, every year, the New Hampshire chapter of the Women’s Caucus for Art has been organizing a member exhibit consisting only of 6×6 plaques prepared specifically for that purpose, and for that year. The price for each plaque is $66. Every media imaginable is represented. The plaques can even be used to create 3-D artworks as long as they can still be hung vertically. As this unit, Lotus Studies has been exhibited three times–once at the 2010 WCA “Flowers Interpreted” exhibit (another annual event), then at the Gallery at 100 Market Street in Portsmouth, and finally this spring at the Manchester Artists Association Gallery, where it won the Best in Show award. Though much admired in all these locations, it is unaccountably still available for purchase. For this year’s 6×6 exhibit, I have decided to feature critters. I led off my blog (up above) with a half-finished study of that most endearing of critters, a sleeping cat. I’m going to call it “At Home”. Ironically, my model is Sundance, a rough, tough rescued cat who ultimately chose to rough it in the neighborhood. He relies on other suckers in the neighborhood to feed him regularly and suns himself on my deck occasionally. So although he looks really “at home” in this painting, he is dreaming anarchy (on my bed, by the way). I need help with the Snowy Egret. There is a lot of empty space on the left of the plaque, which I intend to fill with written words. Poetic words. I am not a reader of poetry, so I don’t have any useful couplets filed away in my brain, but maybe one of my readers does. This one I propose to title “Red Breasted Plover”. There is of course no such thing as a red breasted plover (this one is, I think, a black breasted plover in winter plumage). The red breast here is a reflection of the red canopy. Is that obvious enough to explain the title? Or will people think “red breasted plover” is a real species? If you have been with me for a while, you might remember the Egret and the Plover from my trip to Florida in 2010, the year I deployed the zoom lens to such good effect. If not, you can see them here. Nineteen months later I finally got around to painting these birds! The WCA 6×6 exhibit this tenth anniversary year will include the 6×6’s from prior years, so I guess my lotuses get out and about for the fifth time. The place of the exhibit will be in Nashua, and the length of the exhibit will be only 2, perhaps 3, days in November. A short, almost “pop up” type exhibit may generate more concentrated interest, and exhibit spaces that we couldn’t consider for a month-long exhibit become feasible. I will post more information about the exhibit when the date draws near. For more about the cat, search “Grace”. I adopted her last year. I was going to post some pictures of drawings from our Saturday Life Group, but I think this is enough for now. Next week I am sure to have lots to talk about, because I will be attending a workshop with Stan Moeller, the guy who opened up the door to landscape painting for me back in the Fall of 2005. The subject of this workshop is near and dear to my heart:–how to paint people into your plein air landscapes. I have been practicing that very thing in anticipation of this workshop, and now I will learn the real scoop. . . . fingers crossed, that there is a real scoop to be had! “It’s all in the details” — a statement considered wise when the subject matter is policy. What about when the subject is art? Recently, I visited an exhibit of Dutch and Flemish paintings from the 17th-18th century, wherein the details were really important. Before photography, paintings were valued as records; the tiniest of details were appreciated. But in this day and age, details can be a hindrance to artistic expression. Representation, as opposed to abstraction, is even looked down upon in some quarters. Abstraction is the ultimate in detail-elimination. Only last week one of my followers commented, “Your drawings are magnificent. Great attention to detail. Superb!” Alas, his approval, to the extent based on my attention to detail, may be misplaced. I have to acknowledge a contrary judgment–that in general, attention to detail is not a good thing, and that in particular, my attention to detail is more of a handicap than an ornament to the quality of my output. Which is just a long way of saying, I expend too much energy on details. At one point during the Red Chalk workshop, Rob Liberace asked me to dial back on the details–I was making a virtual skeleton out of our lean model. Referring to the portrait above, “Kitsch,” Cameron Bennett suggested last Thursday. Ouch! Take this week’s portrait from a live model, posted as the cover image for this blog. As soon as I caught Rebecca’s likeness and properly placed and sized all her features, I spent considerable time working on the details, or what I was then considering the nuances of her features–especially her mouth and eyes. It was at the end of that session that I got the “kitsch” remark. Ouch–that still hurts! At least when copying a work done by a master, I cannot be criticized for the sin of detail. The detail, or lack of it, comes already supplied. Here is this week’s homework assignment, from a self-portrait by 20th century Italian artist, Pietro Annigoni. The whole point of copying, may I remind those of you who abhor the slavishness of copying, is to train the copyist’s eye. If I cannot see how my ear is different from the original’s ear, how can I expect to paint a good representation of a real, live ear? So there is the original, on the right, with my copy on the left. Sitting on my easel, my copy looked virtually perfect to me–I fantasized Cameron accusing me of tracing the image. Here, not so perfect. A decent copy, but far from perfect. I gnash my teeth in frustration! How did the bloody head get so elongated in the original, with me not noticing? This is why artists resort to projecting drawings onto their canvases from photographs, a practice frowned on by purists, and one that certainly does nothing to train the eye. Fury it is that motivates them! But back to the topic–Death to Details. With this new anti-detail directive freshly absorbed, giving a nod to Peter Granucci here as well since he also has tried to wean me away from focusing on details when drawing from a live model, I took out a painting that had never satisfied me. This was a painting based on a drawing made with a live model. I had no details to refer to –the painting itself was several references removed from the original drawing since I had painted over it several times trying to find a version that pleased me. Could I solve this painting by eliminating even more details? The only part of this painting that I liked was the hand and the drape at the bottom, so I felt free to mess with the rest of it. I tried muting the background. I changed the hairdo. I refreshed the skin tones and created large splashes of light. Finally, taking a cue from the hand that I did like, I outlined the figure in black. Suddenly, it looked interesting. I never use black ordinarily, so this was definitely weird. I scumbled (a technique for applying a glaze but with a dry brush) more black into the background and it got even better. Ultimately the color, and maybe the contrast may save this painting. But my curiosity to obliterate detail is what motivated me to revisit this painting. Maybe that makes no logical sense, but hey, that’s left brain for you! Meanwhile, and D, I’m talking to you, don’t praise my attention to detail. It’ll just make me squirm uncomfortably. This blog started out over two years ago (!) with no particular angle on my painting adventures, but has begun to develop as a chronicle of my efforts to grow as an artist. So I have come up, finally, with a name for it: Painter’s Progress–playing on the phrase “Pilgrim’s Progress”, a religious tome from a time period when details in paintings were expected and desired. I lead off today with my last red chalk drawing done in the course of last week’s workshop with Rob Liberace, “Drawing the Figure in Red Chalk”. He thought this drawing was my best from the three days, and who am I to argue with the Master. The workshop was a fabulous experience. The “students” included Sean Beavers, who was my instructor just a few weeks ago, and Larry Christian, who was my first figure drawing instructor at the Institute in 2006. I suspect that many of the faces who were unknown to me belonged to other long-established professionals as well. The red chalk is not actually red chalk, but rather any soft red drawing material that simulates the red chalk used by the old masters. We deployed pencils and pastels of various properties, but the principal difference was softness. The harder pencil drawings work better on a smaller scale; detail is easier with a pencil while covering a large sheet with pencil is not fun. So conversely the larger the sheet you want to use, the softer is the material you choose. Obvious that should have been, yet a revelation to me. My output for Day 1 was perhaps suppressed due to my confusion about the paper. Based on information received with our materials list, I had pretreated sheets of paper with dilute amber shellac–on the wrong side. Drawing paper comes with two different surfaces–one side is rough, the other is smooth. I should have used the smooth side, not the rough side. No way to know. Then it turned out that when using the softer materials, you don’t need to treat the surface of the paper after all. Fortunately, I had some extra paper at home, and I came back on Day 2 armed with every possible configuration of treated and untreated sides. For both Day 2 and Day 3 we had the same model, an 80-year-old guy whose body was so lean that he was practically a textbook on anatomy. This was my best likeness of our model. Here I was using the softer pencils and little bit of the pastel stick. The duration of this pose was only an hour. When I was only halfway through,m Rob Liberace sat down and made almost imperceptible improvements to the face. Far be it from me to cover up Rob’s marks with my own improvements, hence the slightly kooky face. Why was this one the favorite of Rob Liberace? He advocates using what I can only call “squirrely” lines, and in this drawing, I tried extra hard to make sure I had no straight lines. He also particularly loved the foot. Here is a copy of one of his drawings, which shows pretty clearly what he was looking for. The link I gave you at the top of this page should lead you to this image, and from there you can find others of his figure drawings. It’s pretty humbling for me to see his and mine next to each other. Surprise! Monday blog is a day early because tomorrow I am over my head with exciting engagements that leave me no time to blog: First, workshop with Robert Liberace learning how to draw figures in red chalk as was done by the Old Masters, and we’re talking OLD old masters–Da Vinci, for example. Then Monday afternoon and evening my bridge group–our three Manchester members anyway–is heading out to Baboosic Lake for an unusually festive visit with Jackie, our Merrimack player–she’s making chili for us and taking us for a boat ride on the Lake in addition to our usually austere bridge playing. The theme today is “profiles” because yesterday Peter Granucci had us anatomizing waves, which I am stretching to mean profiling waves, while earlier in the week, and the week before, in my Portraits class with Cameron Bennett, we started out with profiles. Cameron seems to think profiles are easier than other angles of the head. For him, maybe. Profile #1 is a grisaille (black and white) copy of a Jacob Collins head, which we started in class and are supposed to be finishing up as homework over a two-week period. I trust that by combining the photo original with my copy, I will meet the “fair use” exception to the copyright rules. Sorry about the glare on the wet paint. I had to blast the light from the front in order to keep the sunlit background from shining through and obliterating what I am trying to show you. Both this project and the next one are taped high up in my window where I can stare at them from time to time and where neither cat can rub up against them. Fur on a painting is not, I have found, a desirable quality. As additional homework over the same two weeks, we had to find ourselves a profile by a master to paint, again in grisaille. I made the immediately obvious choice of Madame X, by John Singer Sargent, which in the original is pretty darn close to black and white anyway. I can see that neither copy is perfect yet, but pinpointing the reason becomes harder and harder as I eliminate the more obvious defects. Every day, I notice something to fix. Madame X’s nose has been a nightmare. Such a unique nose but so very subtly unique that it cannot be captured casually. I knew it would be hard when I chose it. I believe I caught a likeness, albeit not a perfect one. It is a challenge when you have only two hours minus breaks to work with the model. Mine was one of the more complete-looking efforts in the class, but a likeness must come before completeness. At least I’m fast, which gives me more time to capture the likeness–more time to make mistakes and correct them. I am thinking that all the mistakes are necessary markers, milestones to progression. I SHALL get that nose on Madame X right by the end of the week! Meanwhile, waves. Waves are not easy by any means, but let’s face it–you get a lot of latitude on the details as long as you get the elements right. So practicing how to paint waves Saturday with Peter Granucci and my plein air painter friends was a joyful experience. I learned the terms to apply to a wave: “base” “ridge” “eye” and, most interesting, the “dump”. The dump is the part of the wave that is crashing over. The eye is the thinnest part, illuminated by light, which I find the most magical element. The rock doesn’t really fit the theme, but Peter gave us a rock to work on at the end–dessert. I don’t quite know what to do with these four paintings of nonuniform sizes and needing mounting on something harder than air. The hardboard is one possibility. Maybe I shouldn’t try to get all four into one frame. I’m open to ideas–and offers.